Renamed in 2012, the Melvin R. Primas City Hall was constructed in 1929- 1931 at 520 Market Street (“Camden City Hall”). It stands 371 feet tall with a total of 18 floors (“Camden City Hall”). Camden City Hall is made out of granite and has an art deco design that created by Byron Edwards and Alfred Green (Cohen, Phil. “Alfred Green”). 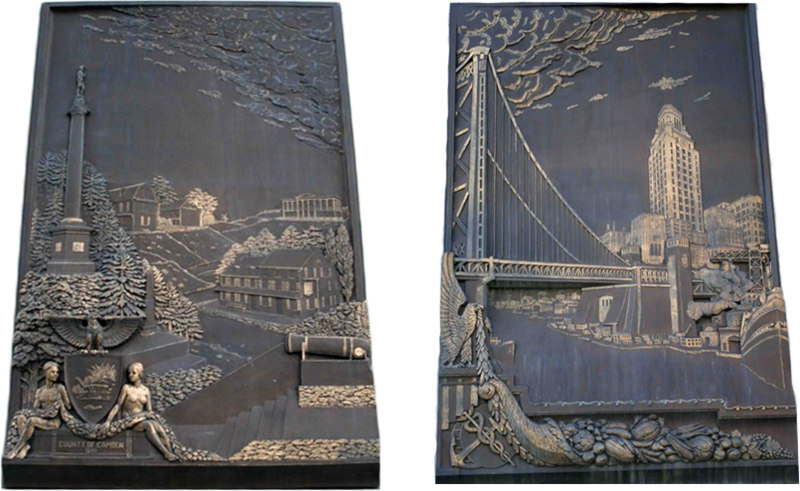 There are two bronze reliefs which are the building’s most viewable and detailed artworks. The reliefs are 20×15 feet on the back of either side of the building. They were founded by the Gorham Manufacturing Company and created by the sculptor, E. Vonhebel, in 1930(“(City Hall Reliefs), (sculpture)”). The reliefs depict two different periods of Camden and South Jersey. But they show more than historic information of Camden; they present Camden potentials as well. Vonhebel, E., sculptor. Gorham Manufacturing Company, founder. (City Hall Reliefs), (sculpture). 1930s. City of Camden, City Hall, Camden, New Jersey. Digital File. The north side relief depicts the start of Gloucester County which would later become Camden County. With this in mind, the two naked figures can be seen by the year 1844 as Adam and Eve, a symbol of where all of Camden was created. However, the relief can also represent the cities of America as well. As it shows a small village or town landscape, it can represent where all the cities of America came from. With time, the cities gradually grew by building their trade, their way of living, their education, ­ and their government as they fought for their independence and their freedom through multiple wars. As years passed, they continued to evolve through the advancement of new engineering and new technology which led to the era of industrialization. It is this industrialization that the south side relief shows; the industrial era of Camden is a past that not many people would believe existed compared to the condition it is in now. In the mid-1800s, “Camden attracted both immigrant work force and the capital to establish its own industrial base” (Howard 17). It was where various companies began and grew which provide life to Camden. Eventually, and among other variables, Camden unfortunately became one of the most dangerous cities in America as it has the highest crime rate in the country (“Camden No. 1 again…”). However, the history or the memory of Camden’s past has faded from the minds of the public, so that the meaning behind the reliefs is unclear and maybe almost non-existent. According to Connerton, Camden’s reputation has become somewhat of a cognitive memory claim of the people (22). Many individuals learn about Camden by stories on the news which they associate with what they see throughout the neighborhood. Soon, they can naturally understand the meaning of the phrase “It’s Camden” because they remember what they have learned about Camden which is the negative; a memory that only accommodates those facts that suit it (Nora 8). The reliefs on Camden City Hall give a different view of Camden because it is, according to Nora, a lieux de memoire or a site of memory. Camden does not have any real environment of memory since time has corrupted the area and given the city a permanent negative reputation (Nora 7). As lieux de memoire are remains, the pieces of memory that barely survived since it has been abandoned, the reliefs are remains of the history of what Camden was which many individuals do not know of or could imagine it occurred at all (Nora 12). But despite what the general public’s views of Camden are, in downtown there is something that counters their views. In seeing the clear difference of what Camden was to what Camden is now, the reliefs present what Camden can become. If old Camden is to be revived from its dead state, then what is need is “the foundation that made the city one of the most economically productive in the nation” (Howard 17) and the people to rely “on each other for mutual support” as the people who lived in Camden used to do (Howard 26). Camden City Hall can represent the potential that, with time and effort, Camden can once again become a great city that can grow towards a brighter future. “(City Hall Reliefs), (sculpture).” 2012.Web. “Camden No. 1 again…” 2013.Web. Cohen, Phil. “Alfred Green.” 2013.Web. Connerton, Paul. “Social Memory.” How Societies Remember. Cambridge, New York, Port Chester, Melbourne, Sydney: Cambridge University PressPrint. Gillette, Howard. Camden After the Fall: Decline and Renewal in a Post-Industrial City. Philadelphia: University of Pennsylvania Press, 2005. Print. Politics and Culture in Modern America . Nora, Pierre. “Between Memory and History: Les Lieux De Memoire .” Representations 26 (1989): 7-24. Print. Page last updated at 3:09 pm May 21, 2013 . This page was printed from cyrilreade.camden.rutgers.edu/camden/city-hall-reliefs/ on Wednesday, April 24, 2019.